I have the same problem using Firefox. It's ok in Chrome though. Regarding the "resolved" link, our IT should investigate. From my side, if I click on the links, all runs good. @janhess: I believe the browser is not here a source of the issue. First, thanks for fast reply! I'm using Google Chrome Janhess .I don't thought in browsers. @ocarbone The problem continues, i can login in http://www.talend.com/user/ correctly but i can't in https://help.talend.com/display/HOME/Welcome so i can't access to Help Center and neither mark topics as resolves. Please try to login directly to THC thanks to https://help.talend.com/login.action ... hope this help! Error appears: "Sorry, your username and password are incorrect. Please try again." After more investigation, I have found the issue... a user exists for the account Vlopez in help.talend.com, but this account is linked to another existing user (a homonym). That's why the login in help.talend.com is not possible, in fact your own account doesn't exist. I have opened a ticket to alert our IT, they should check the unicity of the "Vlopez" data to fix this issue. Additionally at the other question, I can't mark my post as resolved. I click on the link 2set this topic..." but just redirect me and not put the case as resolved? We found a bug on fluxbb which prevents a topic from being set as resolved when there is an apostrophe in a topic title. Can you confirm this is your case? If you remove the apostrophe (like using "does not" rather than "doesn't" basically) you should be able to set your topic as resolved. Regarding your login issue, we'll investigate further and will let you know when you can try again. We have known SSO issues, that are quite complex to fix (some synchronization that doesn't take place where it should). We're doing our best to solve it asap. Thanks for delivery, No, in my case i can mark as resolved 2 post, and others not. Thanks for help me guys, Regards! Thanks for your reply, can you show us an example topic which you can't mark it as resolved? Talend-->the global leader of open source data management and application integration solutions! i can't mark as resolved none post until today, i don't know how but now they works all the post..
so thanks for help to all! I can login to the help centre but when I go to the forum it want's me to login. The login details flash up then it reverts to the forum page not logged in. This is in Firefox. I can login to the forum using Google Chrome. Is it working after clearing firefox cookies completely then login? We have reported your issue to our manager then come back to you as soon as we can. I want to download documentation but it keep redirecting me to login page. login/logout or changing the browser didn't solve the issue. Can you download user manuals from talend official website http://www.talend.com/download/data-int … data_integ? 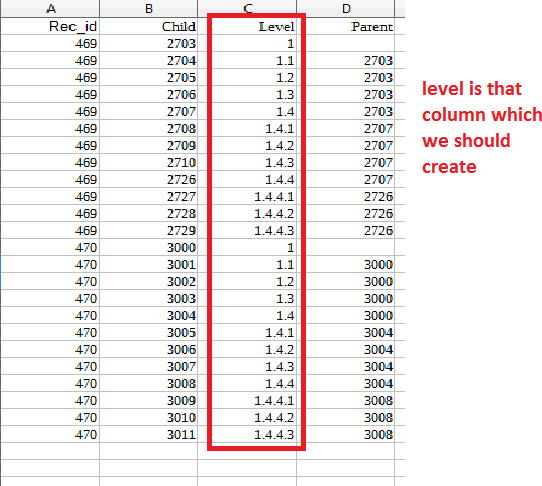 Based on that parent child relationship i have to create the levels as mentioned in the below image. 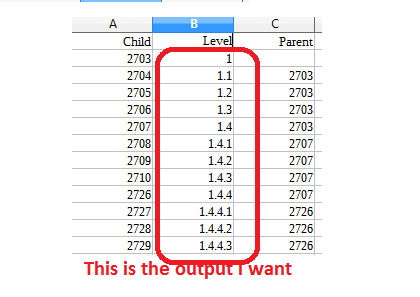 So based on that recipe_id and depends on the parent child relationship we have to create the levels.